Check out our Blog for What's New! Building a garage is an important investment of time and resources, and to do it right the first time takes planning. Choosing the perfect floor plan involves identifying factors such as size, functionality and design before embarking on the building process. With options ranging from Carport Plans to Carriage House Plans, The Garage Plan Shop can help you feel confident knowing you found the right garage designs to suit your unique lifestyle. Here is an in-depth look into how to select the plan that is right for you. When choosing a plan, it's important to think about your present situation as well as the future. The Garage Plan Shop has garage designs ranging anywhere from one-car to multi-car. If you only own one car, we offer a variety of One-Car Garage plans, including some with extra workspace and others with lofts. However, it may be best to invest in garage floor plans with RV or boat storage now if you plan on making those purchases in the future. Also, think about the climate and area in which you live. If you live in a region with extreme temperature changes, such as snow or hail making it impossible to keep a car outdoors, you will want to consider a floor plan with enough space to protect all of your vehicles. Garages not only provide space for automobiles, but they can also serve many other purposes such as storage, mechanics and living space. We offer a wide-range of garage designs with storage areas for sporting equipment, mechanic tools or any overflow from basements and attics. Typically sized for one or more cars and detached from the home, our Garage Plans with Storage can help create the extra space needed to live comfortably. Similarly, we provide Garage Workshop Plans with extra parking spaces and work areas for those who have hobbies such as crafting and woodworking. If you would benefit from extra living space either for family members or rentals, we offer Garage Apartment Plans fully equipped with bedrooms, bathrooms, a kitchen and dining room, as well as space for two or three vehicles. After finding garage floor plans that meet your overall needs, the next step is to decide on the external design. Although some plans work best as attached or detached from the home, it is ultimately your choice as to how the garage should be laid out. The Garage Plan Shop features plans designed by leading architects and designers to assure that you find the best way to coordinate your new garage with the style of your home including the type of doors, windows, roof style and finish. A garage that mimics the style of the home will more often have a higher resale value than those that do not match. We offer a variety of garage floor plans including loft plans that come in a wide variety of architectural style and sizes to complement an existing home. If you're ready to find the perfect plan for your garage-building project, The Garage Plan Shop can accommodate any unique lifestyle. Try our advanced search to narrow your choices and help you find exactly what you need. The plans found on TheGaragePlanShop.com website were designed to meet or exceed the requirements of the nationally recognized building code in effect at the place and time the plan was drawn. 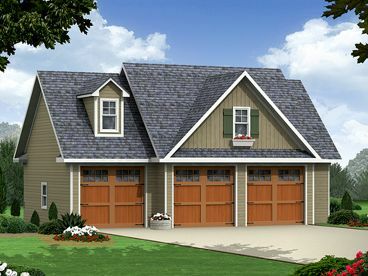 Note: Due to the wide variety of garage plans available from various North American designers and architects throughout the United States and Canada and varying local and regional building codes, TheGaragePlanShop.com does not guarantee the blueprints will meet building codes for all areas. It is the responsibility of the owner and/or builder to ensure these garage plans comply with local building codes. All garage plans purchased through TheGaragePlanShop.com are provided as-is and are copyrighted by their respective architects and designers. For more information, please review Terms and Conditions.